Package 1 $1400 - 6 days of class, 1 free included Therapeutic Singing Bowls the ZT900($235)(The Foundation bowl of the class), and our 300 page Color Manual($350). The $1400 is an early discount available until 5/1/19 (The price is $1500 if paid after 5/1/19). Package 2 $2100 - 6 days of class, 4 free included Therapeutic Singing Bowls the ZT900($235), ZT1300h($340), ZT2000($525) and ZT300t2($80)(a higher body bowl) (These are 4 main bowls we use in the class, and this package is enough to start practicing immediately after class), and 300 page Color Manual($350). The $2100 is an early discount available until 5/1/19 (The price is $2200 if paid after 5/1/19 ). A $500 deposit will lock in your seat in the class, balance due two weeks before the first day of class. If you wish to take advantage of the early bird discount you must be paid in full by May 1, 2019. Limited spaces available. Tuition cost covers six days of intensive practice under the supervision of Vibrational Sound Association (VSA) accredited instructors. The procedures in the class are limited to the 1-4 bowls at a time, which keeps the method both simple and cost effective. Additional bowls are added to the procedure and are also available for purchase throughout the class. All bowls and tools used in the classroom will be provided for use during the class. Each day, the intensive program starts with a short sound meditation followed with an incredible balance of community, communications, learning, live demonstration and hands on practice. In addition, every day each student both receives and preforms a Vibrational Sound Therapy procedure designed to help the student learn and be able to preform the Vibrational Sound Therapy in any number of real world situations. Participants in the course are introduced to all of the modern variations of metal singing bowls in unprecedented number and variation, a limited number of antique Himalayan bowls, Tingsha chimes, hand chimes, and our exclusive line of Therapeutic grade singing bowls that are featured throughout the course. Gongs and crystal bowls are touched upon and used during brief parts of practice, yet are not the focus of the course. 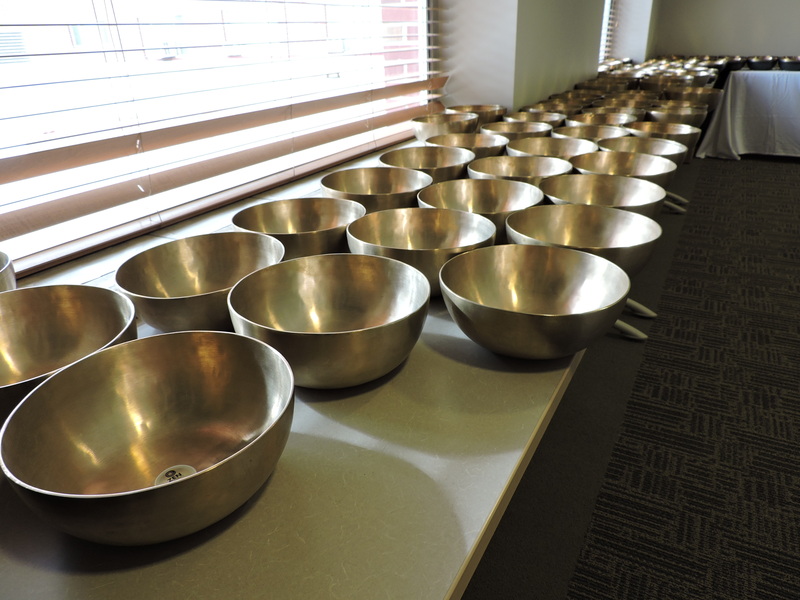 Over 100 singing bowls and other instruments available to explore and use during the class. The bowls featured in the class are the perfect costars to our highly trained practitioners. All hand hammered singing bowls have some therapeutic qualities to the sound. The distinction that we draw with our bowls, is that we are the only singing bowl school in the USA today using and promoting, engineered Therapeutic grade singing bowls. Therapeutic grade singing bowls may have a similar look to traditional hand hammered bowls, but that is where the similarities end. The bowls used in the course are world-class instruments, specifically engineered to provide vibration over sound. The sizes and vibrational characteristics are matched to appropriate body zones in the course. We don’t have to create an elaborate cover story to justify the presence of toxic metals in the bowls that we use. Our Therapeutic series bowls were designed for use in hospitals and are the safest singing bowls on the market today. Using pure metals in the construction of the bowls has allowed us control over their content. 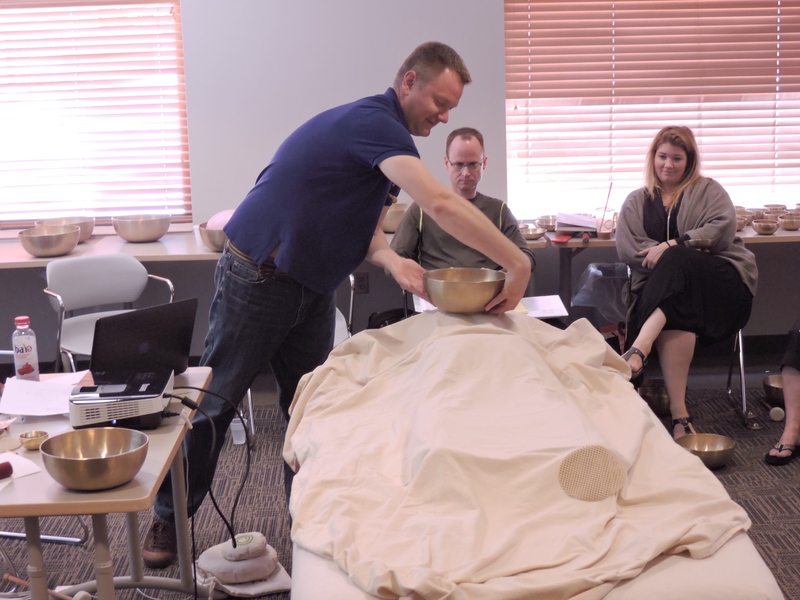 Our future practitioners enjoy learning and discussing the fundamental ideas behind the Vibrational Sound Therapy, the history of Himalayan singing bowls, the physics of sound, and psycho-acoustics. These subjects provide the practitioner with a solid knowledge base from which to confidently practice the method. These ideas are reinforced through live demonstration, and the practice of the method itself. Practitioners are attuned to sound in wholly new ways through the intensive program. Many of our past students have made note of this, gaining a new understanding of sound itself through the course, and forever changing the way we hear the world around us. Attracting practitioners from the widest scope of backgrounds provides each class with a unique perspective on the treatment. Each day finds students from different backgrounds interacting with one another, all in the scope of learning and applying this powerful modality. Students are paired with new partners everyday, insuring that the practice sessions are as varied and diverse as the class itself. Limiting our class sizes allows direct interaction between students and instructors. It also limits the amount of distraction and allows us to deliver a massive amount of information in the time that we share. Working with the bowls directly on the body strengthens the effect of the powerful vibrations that come from the specially engineered Therapeutic singing bowls. Practitioners are able to see and understand the results of the method the very first day when they preform their first Vibrational Sound Therapy Session. The Vibrational Sound Therapy modality is the first of it’s kind, eschewing cultural appropriation and seeking instead a common ground based on scientific principles and effective techniques. This is another reason the Vibrational Sound Therapy Method is so powerful. We are able to adapt the techniques to interface with any existing modality. This is evident when you look at a cross section of who is taking our classes. Work with singing bowl massage as a stand-alone practice. Add a sound based modality to your current technique repertoire. Vibrational Sound Therapy is the perfect companion to massage therapy, reiki, and chiropractic services, psychotherapy, music therapy, acupressure, and acupuncture, dental and medical services. The practitioner is able to work within an established institution, providing complimentary services, which increases the market share of spas, healing centers, yoga centers, or retreat centers. We currently have practitioners providing relaxation therapy in professional medical settings where the profound effect has presented incredible results. Now we want you to join us! We have over 100 graduates in the Vibrational Sound Therapy Method around the globe from the USA, Canada, Europe, and the Caribbean. You will find certified practitioners with an incredible range of backgrounds, working in a broad variety of fields. From elementary school teachers to light workers, yoga teachers and kirtan leaders, we see our influence spreading. Retailers of singing bowls gain an incredible amount of knowledge during the course, helping them to better cater to the needs of their customers. Therapists and counselors are using our modality to introduce a new way of life to people who are suffering. The Therapeutic series bowls are being used in the offices of psychologists and in the homes of retired individuals with equal benefit. The modality is universally effective and our practitioners emerge from our program ready to provide the techniques to the public. Massage therapists are finding the Vibrational Sound Therapy to be the perfect addition to the knowledge base they are already working with. The procedure is designed to be preformed on a massage table, so the equipment is very similar as well, but that is where the comparison ends. The Vibrational Sound Therapy Method allows the busy massage professional to provide a treatment that is as gentle to the practitioner as it is to the client. For energy workers, Reiki Masters and practitioners of Qi-gong we find a synchronous harmony with the Vibrational Sound Therapy blending seamlessly with almost all forms of energy work and healing. Most of you are already using singing bowls to some degree. For those of you already experienced in the use of the bowls the modality will flow smoothly. For the beginner we have provided a structure that is simple and easy to follow, yet unanimously effective. In addition to the Vibrational Sound Therapy taught with a handful of variations, several other techniques are taught and explained in the class such as using the bowls, or combinations of the bowls in grounding or energizing techniques. These expanded techniques provide more physical demonstrations of the power of the Therapeutic grade singing bowls. This helps to give clients both existing and prospective a great introduction to the power of the bowls. Jeff Howard, with over fifteen years of experience with singing bowls, traveling the world and learning about sound therapy in many cultures including Tibet, Nepal, India, Thailand, USA, and China. Jeff created the Vibrational Sound Association (VSA) to offer singing bowl therapy designed with the professional and practitioner in mind. Our course which is now used in Spas, Hospitals, Massage Therapy Clinics, Reiki Practices and many other organizations. 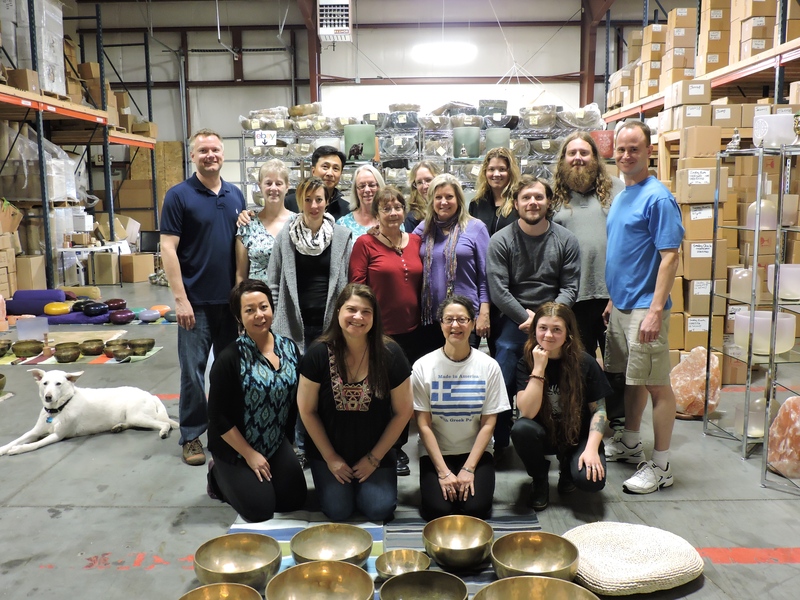 The VSA is dedicated to the continued evolution of the Vibrational Sound Therapy with singing bowls. 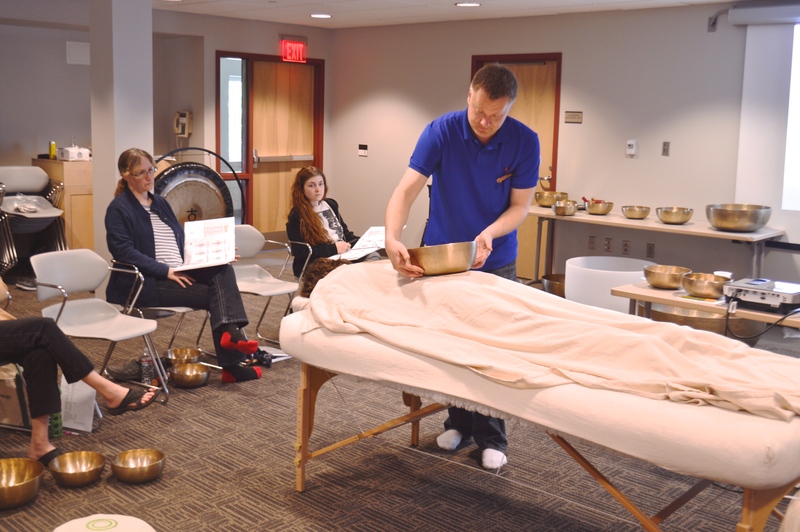 Vibrational Sound Therapy is a method of professionally using singing bowls and other instruments on and around the body for therapy and relaxation. The VSA seeks to further the use of these ancient tools in a professional modern and structured modality that is an efficient relaxation and therapy system. This is a secular course with no need for any specific spiritual or religious beliefs and relies on proven methods of using sound and vibration for therapy. Full 42 hour course includes instruction from the history and use of sound therapy and massage, the effect of the vibration on the body, the different types of bowls and how they are used, Methods of play, which tools to use with each technique to practitioner client relationship, basic business and beyond. The Vibrational Sound Therapy technique is broken down into both basic and advanced levels and live demonstrations and actual Vibrational Sound Therapy sessions provide the student with hands on knowledge and practice in using this relaxation technique. Basic levels cover the sound therapy itself while advanced levels delve deep into topics like binaural beats, brain entrainment, aura energy, and the Chakra systems. Further techniques are also illustrated in sound meditation and live concert performance, which expand the abilities and knowledge of the practitioner. A certificate of completion will be provided to those who complete the course. 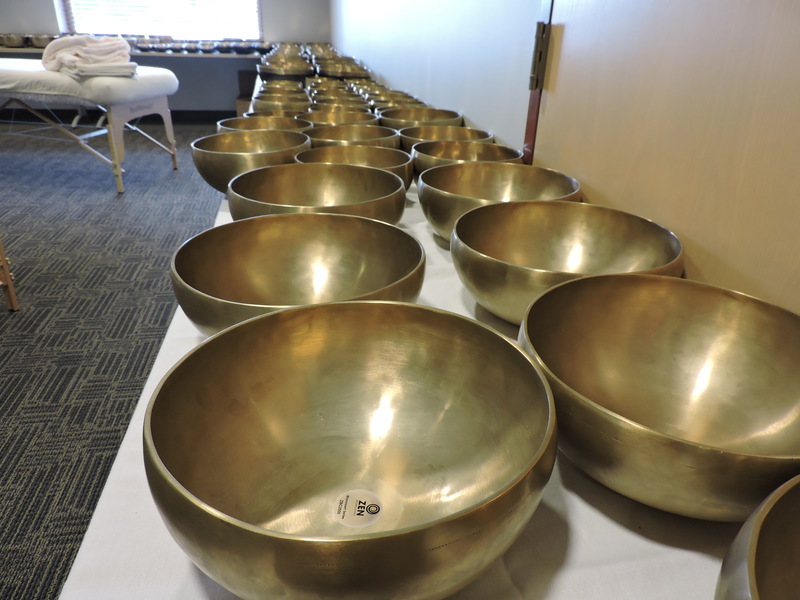 Click the button below to add the VSA Singing Bowl Vibrational Sound Therapy Certification Course Philadelphia, PA 6/1-6/6 2019 to your wish list.